A Chronicle of this World is Forever Being Written. Tales of attack from fearsome creatures, stories of political intrigues, natural catastrophes and the royal successor... all of these are big enough to shake the bowels of the land. 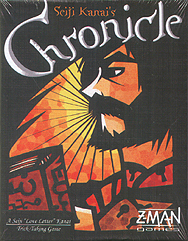 Chronicle is a trick-taking game where each card has an ability and the requirements for winning a trick, and thus gaining allies, changes from hand to hand. Sometimes you need to recruit evil allies and sometimes you cannot have any. Gain enough fame and your name will be chronicled amongst the greats of the world.